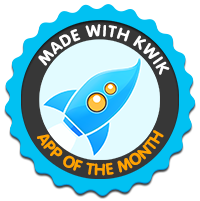 Facebook survey votes (less than twenty votes) did not make justice to the great apps made with Kwik in July. Hopefully this will change in the next months, when people gets familiar with the new App of the Month Award. Kids Song Planet is one of the best apps made with Kwik to date. The illustrations are gorgeous, animations are perfectly timed and the songs selection is addictive. The team from Mooblegum did indeed a great job. With more than 100 interactive elements in 6 songs, 2 mini games, and with the possibility to play the tune together with the song, users will have hours of fun playing! The sing along app is available in both paid and lite versions at Apple and Google Play’s stores. If you missed it or simply want to remember a bit more, take a look at our Showcase. As the reward, the app will receive a review/rating from Digital Storytime. When it is done, we will share the link with our community. Congratulations François and his team at Mooblegum! A special mention to TicTacToe Monkeys for its number of votes in Facebook (a tie with Kids Song, in fact). Great job promoting the contest Froot Media!